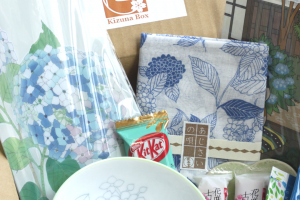 Thank you for subscribing to Kizuna Box! 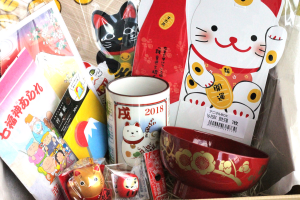 In October, there are various events in the Japanese school. For example, music concerts, athletic meetings, excursions, etc. 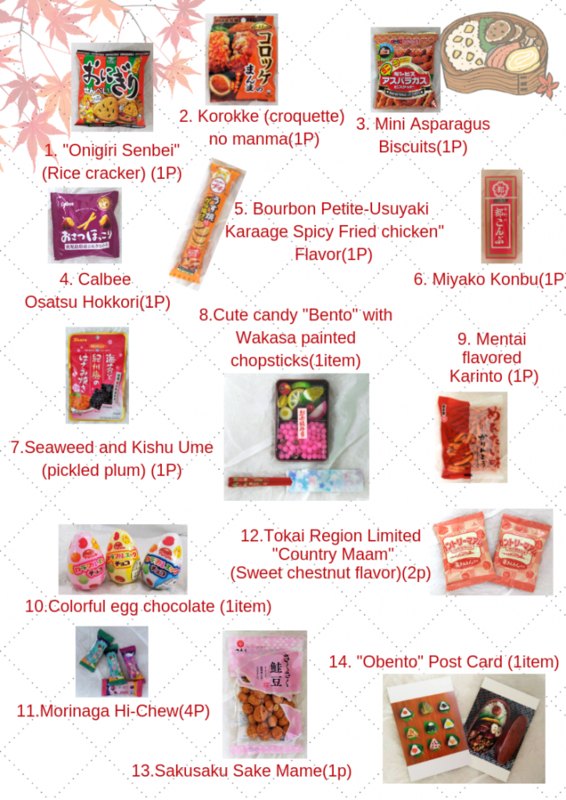 Children are very looking forward to “Obento” (lunch box) at those events. In “Obento”, there are a lot of cooking that the children are pleased with. 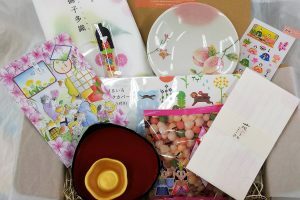 So “Obento” is the treasure for Kids! By the way. 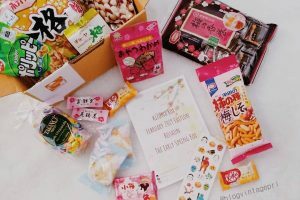 What is inside the “Obento”? Of course “Onigiri” (rice balls)! 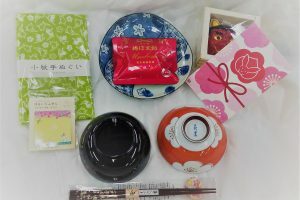 Inside “Onigiri” are popular such as “Ume” (pickled plum), “Sake” (salmon), “Takana”, “Tori-gomoku-Gohan” (Japanese chicken rice), “Yaki Onigiri”(baked rice ball). My child also loves “Tarako” (salted roe of cod). The popular side dish is “dashi-maki tamago” (Thick baked omelet), “Karaage” (Fried chicken) and Seasonal Fruits. 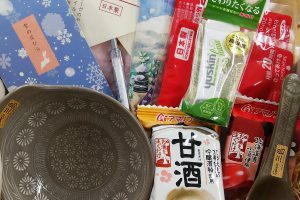 Children also love the snacks they bring with their “Obento”. They are looking forward to sharing with their friends. 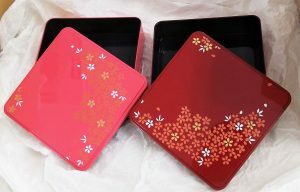 “Jyubako” is Japanese style lunch box with a pattern of cherry blossoms. It is very convenient to take it to go picnic or excursion. It is a small bowl for snacks and desserts. Two small bowls garnish “Obento” gorgeously. You will get two of the 3 colors in your box. This funny hand towel looks like “Onigiri” ! Towel fabric is made in Japan. 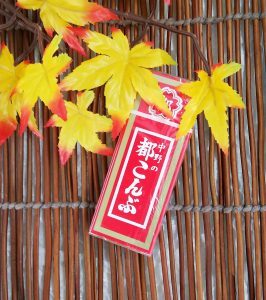 “Kyogi” is the paper of tree used for wrapping “Onigiri” or Japanese sweets. 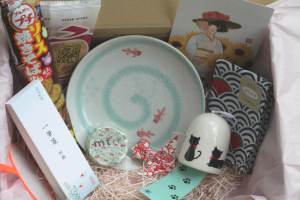 You will get one of the 5 tastes in your box. 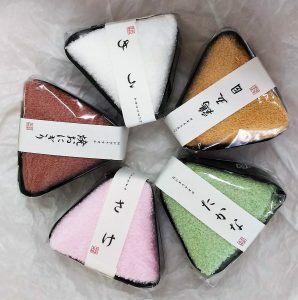 There are five colors, they image the tastes of the “Onigiri”. White = Ume (Pickled plum). Beige= Tori-gomoku-Gohan (Japanese chicken rice). Brown= Yaki Onigiri (baked rice ball). Green =Takana (pickled leaf mustard）. 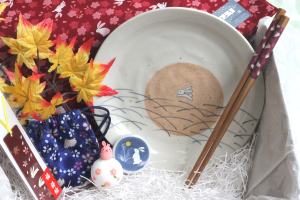 Using this case will add Japanese style taste to your dish. It will add a vivid Japanese shade to your lunch box. 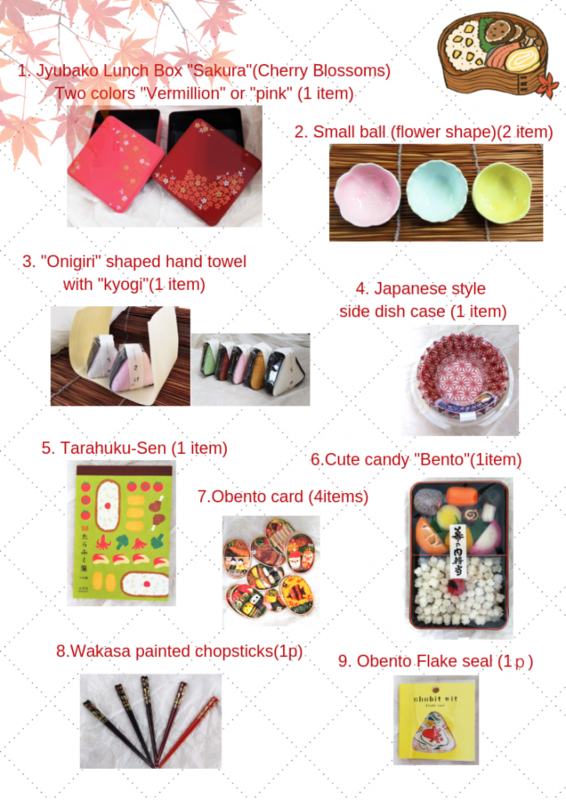 This memo pad is stationery that you can learn about “Obento” in Japan. 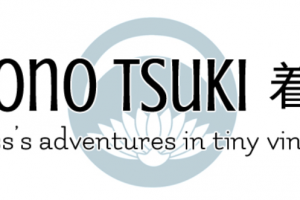 Easy to use even for your letter, So you can carry around it! 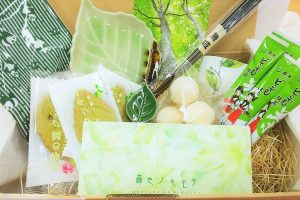 This “Makunouchi-Bento” (deluxe lunch box) is made from Japanese cut candy and “Konpeito” (suger candy). The natural wood chopsticks painted beautiful autumn leaves. You will get one of the 5 colors in your box. It is the cute seal that can be used for wrapping decorations or notebooks. 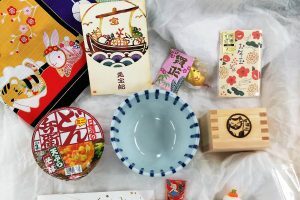 There are 6 kinds of seals about “Obento”. This is the rice cracker in the form of “Onigiri”. Taste is sweet soy sauce. It is a popular rice cracker. It is the biscuitis shaped asparagus. Sweet Potato “Silk Sweet” made in Kagoshima pref. 100% is used. “Miyako Konbu” is a vinegar konbu with plenty of dietary fiber and calcium, it is used from kelp from Hokkaido. 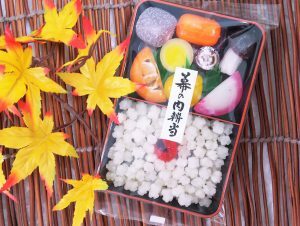 This “Sekihan-Bento” (deluxe lunch box with red-beans rice) is made from Japanese cut candy and “Konpeito” (suger Candy). “Mentai” is salt and red peppers pickle of “cod egg”. 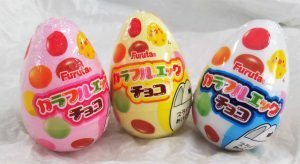 “Mentai” and “Tarako” are used in “Onigiri”. You will get one of the 3 colors in your box. 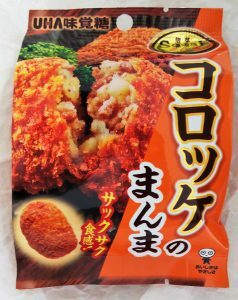 It put on salmon flavored dough on peanuts and finished it as crispy texture snack. This greeting card looks like real “Obento”. You’ll get either a “Obento” Card or a “Onigiri” card.